Here's another video featuring songs of mine, although this time it's a bit more serious than the previous ones. The main aim of this video is to raise awareness of lupus, a pretty serious condition who can totally ruin patients lives and is pretty much unknown to date. Lots of research need to be done yet. The video features two of my songs: Glacier (from 1:53 to 2:31) and A dream of sorts (from 2:59 to 3:10 - this fragment is really short!). Brian Teifer and a friend have created this humourous educational video regarding the (swine) flu and proper hygiene: Wash your hands. And if it wasn't cool enough because it features my most popular song ever (Glacier), it also has a talking pig (maybe a swine would be more appropriate?). It can't get any better! As promised (albeit a little late, but that’s life and business for you) here’s the exact clip from Camille, Andrew, Katrina & Co where my song Glacier was featured. 15 – Hurricane names list from CamilleAndrewKatrinaCo on Vimeo. Meanwhile, Mr. Daniel Dugas has not been idle. His new project, talk mainstream , combines Google Trends, MAX and Apple Script to post strange gibberish to Twitter, each minute. As one could expect, results range from humourous to absurd. Have a look! 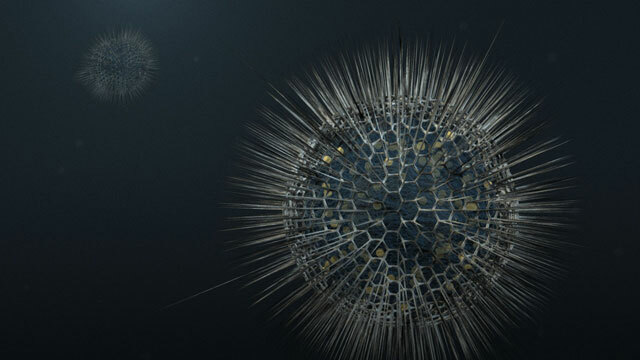 Jonas Drotner has just released a nice short ambient movie featuring spiky things inspired by radiolarians, which are a group of zooplankton thingies that Ernst Haeckel studied early on. More on radiolarians and Haeckel in the mighty Wikipedia, of course. I quite liked the movie, it’s a pity it is that short. Hopefully he’ll be able to come back to the project and create a longer version so that we can see more synthetic plankton, which is always cool!